We have two service centers, Tyr and Tor. There are also nursing rooms at the service centers. You can rent a private bathroom and shower. The gates are closed between 11 PM and 6 AM during the summer. All motor traffic is prohibited during these hours. Wifi. There is also an Internet station at the reception. Buses No. 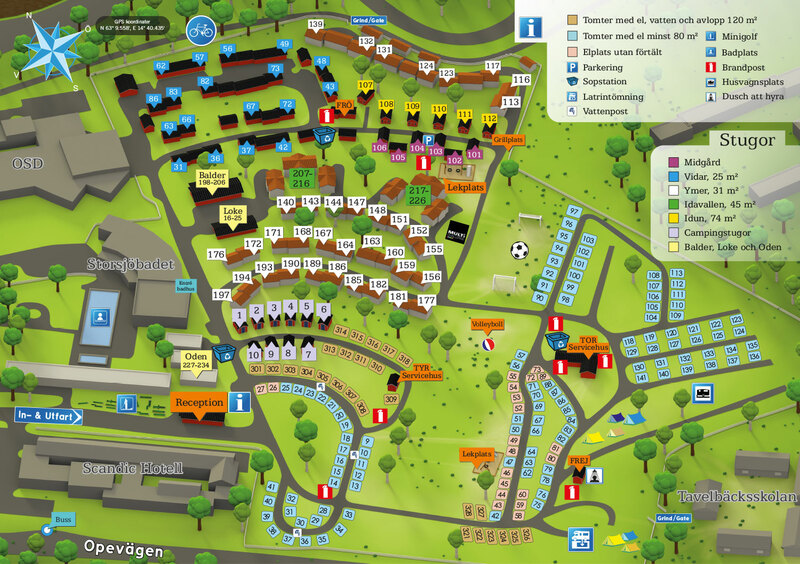 2, 6 and 9 access Östersund Camping, just next to Scandic Hotel. They all go down-town, bus No. 6 and 9 will also access the train station. There are two laundromates in the camping. Each of which contains 3 laundry machines, 3 tumble dryers and a drying cupboard. 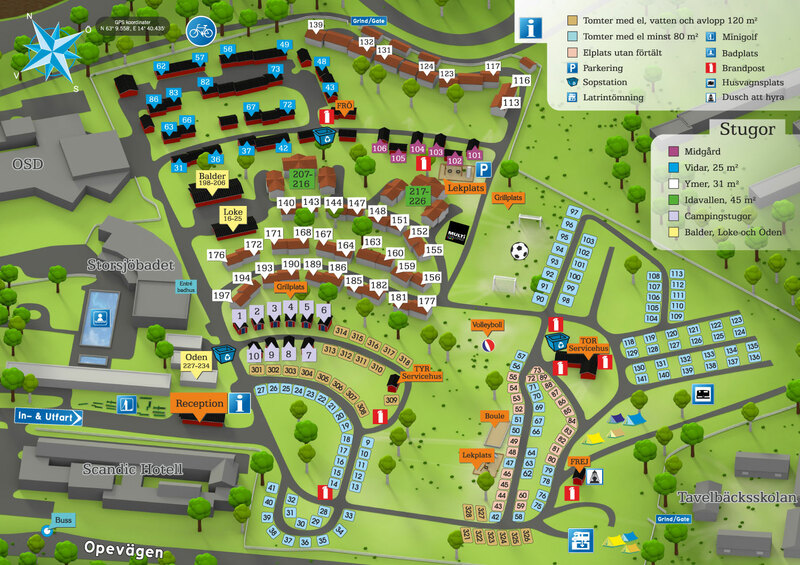 We are members of The Swedish Camping & Cottage rental organisation – SCR. With Camping Key Europe, you get access to quick and easy check-in and check-out in your mobile whenever you visit a campsite, which means you do not have to deal with plastic card hassle and manual registration. You also get access to all available benefits in one place as well as an overview of your camping history through the digital camping journal. Camping Key Europe can be activated on up to three devices simultaneously and be used offline for five days but must be online when updating. You will receive a reminder when it is time to renew your Camping Key Europe. Storsjöbadet – A magnificent water park, upgraded in 2008 for an even greater adventure. OSD – Excellent facilities for conferences, meetings and entertainment. Restaurant and bar. Cirkle K – Gas station and mini market, open 24/7. Ica Supermarket Odenhallen – Grocerie Store (500 meters). Multi Challenge – Competitions, adventure, laser hall, slot-car, gokart, climbing wall and lots of other fun stuff.